Hello everyone! So today I thought that I would talk to you all about starting your very own blog. With Christmas coming up I know some of you might be receiving new cameras or laptops etc and may be thinking to start your own blog in the new year. When I started my blog I watched a tips and advice video on youtube that Zoe and Louise did and it really helped me so I thought why not do a tips and advice post for all of you thinking of starting your very own blogs. Now just as a little disclaimer this by no means means that I am an expert on blogging and I think I know everything. Since I've started a blog I've had a few of my friends follow me on this journey and it has inspired some of them to start their own blogs. This post is basically what helped me and what could help you start your very own blogging journey. Enjoy! Now personally for me I think blogger is the easier platform to start your blog. However you can also use sites such as tumblr and wordpress which are both becoming increasingly popular. Like I've said I personally think blogger is so much easy to navigate and type things up on. I'd highly recommend using blogger however if you want something that's easy to get a nice layout then maybe Tumblr would be better for you as there are a lot more options for layouts and themes for free than there are for blogger. The next stage is deciding on your design. Blogger has some nice simple designs, however if you want something a bit more then I'd recommend Designs Crazed for beautiful free designs. If perhaps you want to have someone design your own blog or want to pay for a design I'd recommend the two girls who I've used when it comes to blog designs, Felicity from Pursuit Of Felicity who designed my current design and Dana Fox from Wonder Forest who has beautiful templates ready made. When it comes to naming your blog there are a number of things you can take into consideration such as the theme of your blog, your interests and even your name. I decided to go with my first two names as it was just easier for me and I'm glad that I stuck to it. Maybe in the future I will change it but right now I am pretty happy with it. What I will say is make sure you research a little bit to make sure nobody has the same name as you. You don't want to get comments saying that you copied somebody else's blog name or stole their idea. What a lot of people seem to realise is that you need to have a themed blog. I've had a couple of my friends ask me why I've done a couple of lifestyle posts or tags on my blog considering that it's meant to be beauty but I think it is good to mix up your blog every now and then. Even though my blog is supposed to be beauty I am not always in the mood to right about beauty. Moral of the story is that you do not have to have a themed blog. A good example is Becky from MilkBubbleTea's blog. 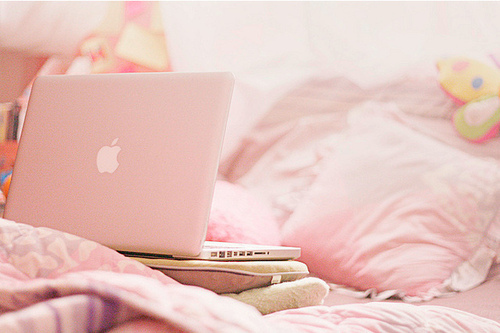 Her blog is a lifestyle blog which contains beauty, fashion, what she does in her day to day life and even recipies. She blogs about what she wants to blog about and I think that's brilliant. If you blog about things because you think other people want to read them it can come across that way. There is no right way to blog as long as you love what you are writing about. Now I spoke about this in my What I've Learnt From Blogging post but I'll talk about it a little bit more. If you want to come across new blogs and maybe get to know other bloggers and get some inspiration social media is the best way to do it. I'm on all social media platforms and have met some lovely bloggers on all of them. My top two are bloglovin' and twitter. On twitter you can find bloggers with the same interests as you and take part in different bloggers chats throughout the week. Bloglovin' is the easier way to find blogs from different categories and also the easiest way to follow other blogs too. If you want people to know when you publish a new post it is the easier thing to use. Other good sites include pinterest, instagram and tumblr where you can get inspiration and also post photos from your blog. If you have started a blog purely because you have read blogs before and have seen your favourites get freebies then you are blogging for completely the wrong reason and it can come across that way as well. Bloggers don't get freebies for doing nothing. Very often the freebies are sent to the blogger for review purposes and other considerations. You don't get given them for doing nothing and I think that is a very important aspect to remember. I've worked hard on my blog for two years and not received anything and I really don't care because I still love what I do. I think that's the most important thing when it comes to starting a blog. Blog because you have a passion for writing and because you love it. I'm sure you've all heard of writers block which is when you are stuck on ideas for what to talk about? Well that is exactly the same as bloggers blog and I've had a lot of cases for that. In fact I had bloggers block which was why I thought of this post. It is very common and I know a lot of bloggers feel the pressure of blogging everyday purely because they want to keep their readership and grow it. However I think it's important to take a break every now and then as well. If you can't think of anything to write about then don't just write anything as it can come across as rushed. I've seen it with a few of my earliest posts on this blog. Go out, take a walk, read a book and just relax. You might find inspiration elsewhere. However if you really want to post then there are a number of things you could do such as tags. If you are stuck on your first post for example maybe you could do a get to know me tag? If you want to start blogging after Christmas maybe a What I got For Christmas Post or a 2015 Goals and Resolutions post? These are all great ideas that I think will help readers know you, the person behind the blog. So there we have it. A few tips that I thought might help those of you perhaps looking to start your own blog after Christmas or new year. These are all things that have helped me and I am sure that they will help you. If you have started your own blog quite recently then please leave your links in the comments section below or tweet them to me at @xbellefleurx as I would love to support you on your blogging journey! If you have blogged for a long time and have a post like this then leave it linked below as maybe I can gain some inspiration from it myself! Have you thought about starting your own blog before? What made you start your blog if you already have one?